The Larson Electronics RNT-MGL-480-15K-120-208Y-12X120.20 Temporary Power Distribution Station converts 480VAC electrical current into 208Y/120VAC three-phase. 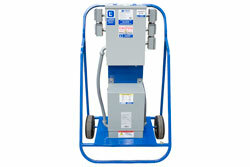 This unit provides operators the ability to safely tap into and distribute 480VAC power from a variety of sources including generators and direct grid power. 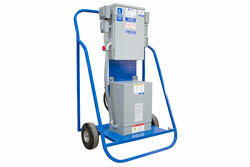 The RNT-MGL-480-15K-120-208Y-12X120.20 temporary power distribution system gives operators the ability to power their 120 and 208 volt equipment from a single system. On the primary side, operators connect 480 volt line-in power using 20` of 10/4 SOOW cord. On the secondary side, operators connect to twelve, duplex GFCI receptacles for 120V equipment. A 20` 10/4 SOOW line-in cord brings 480V three phase power into the NEMA 3R 30-amp 480V three phase primary disconnect, which is fused at 25 amps, and passes power through to the transformer. 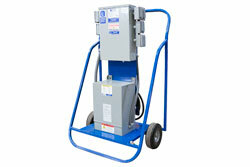 The NEMA 3R 15KVA transformer converts 480V to 208Y/120V three phase and passes the current to the secondary panel. 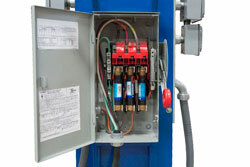 The secondary side of the transformer feeds a NEMA 3R 208Y/120V three-phase 50-amp main lug only panel. This secondary panel contains twelve, 20-amp 125V 1P breakers protecting twelve, 20-amp 125V duplex 520R-GFCI receptacles.